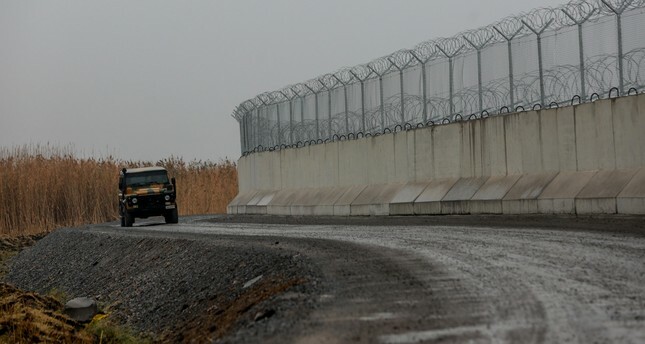 Turkey has completed more than half of a 144-kilometer-long wall along its border with Iran, Interior Minister Süleyman Soylu has confirmed. "I believe that once the construction is completed and the wall is integrated into our border systems, it will play a substantial role in stemming irregular migration, smuggling and the infiltration of terrorists," Soylu said during a visit to the area Sunday. Around 70 kilometers of the structure was completed in just under eight months. Soylu said the main reason behind building a wall along the border was the fight against terrorism. He added that issues like smuggling and irregular migration also necessitated that the structure was built. Welcoming the Iranian government's contributions to Turkey's efforts, Soylu said mutual steps were being taken to increase cooperation in the fight against terrorism and securing the borders which would yield good results for both sides. Turkey decision to build a wall along its border with Iran is being considered to benefit both sides in terms of security. Reports claim that there are a number of PKK camps, hosting approximately 1,000 terrorists, along the Iranian border. In the case of any military operations against the PKK in eastern Turkey, the terrorists easily cross the border and take shelter in those camps. In order to prevent such crossings, the plan to build the wall, similar to that on the Turkey-Syria border, was taken up. The security wall Turkey is building along its 911-kilometer border with Syria is expected to be completed in the spring. It will play a significant role in averting threats against Turkey. Once completed, the border wall will be the third-longest in the world. The interior minister said Turkey will also ramp-up efforts to secure its borders with Georgia and Armenia. In relation to the issue, Soylu said those borders will be protected using other methods instead of walls.